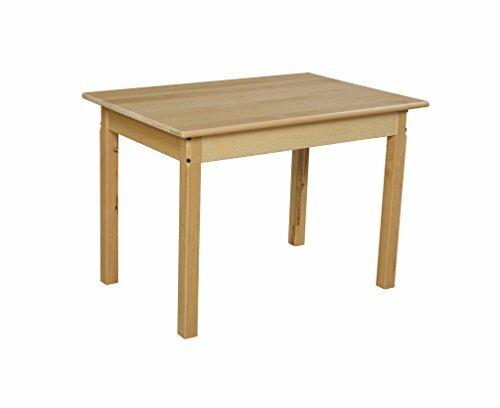 The Wood Designs WD82324 child's table has 24" legs and measures 25 x 36 x 24 inches (H x W x D) and requires assembly. (H is height, the vertical distance from lowest to highest point; W is width, the horizontal distance from left to right; D is depth, the horizontal distance from front to back.) The unassembled unit is made of birch with eased edges and corners for safety, includes hardware, and has a natural finish that resists stains and damage from cleaning solutions. This child's table is Underwriters Laboratories (UL) Greenguard Gold certified for environmental safety and is suitable for use in an educational environment. Wood Designs WD848A1826 24" x 48" Rectangle with Adjustable Legs 18"-26"